The Addicks impressive start to the season continued last night with an impressive win over a more than useful Derby side. It was a pleasure to see tow teams playing decent football in the correct manner. All credit to both managers for that. Derby kept pressing and didn't let up much like their fans in the Jimmy Seed who gave their side good vocal support. Charlton got off to a fantastic start and the first 10 to 15 minutes saw us play some wonderful passing football. That was rewarded with a lovely goal from George that for me was reminiscent of the great Mendonca..........there can be no higher praise. Derby responded by seemingly adjusting their formation and pushing the full backs on and they put us under great pressure that ultimately delivered Ward's equaliser. I was happy for the teams to go in level but George had other ideas. A lovely run into the box saw him tripped and Buyens had no hesitation in taking the resulting spot kick and dispatched it with some aplomb. It was of course a great time to score. Inevitably it was important for the Addicks to weather the storm early in the second half and they did so well. Sadly, George went off at half time with an injury that we'll all hope is not too serious. Clearly we were going to need a third goal and it duly arrived when Jackson's cross was nodded on by Wilson and then put away by Igor. Still Derby pressed and got a lifeline when a mistake from Pope saw the ball squeeze through his legs. The Addicks held firm and went onto secure a second home league win and maintain our unbeaten start. It is pleasing to note Steve McLaren's post-match comments that weren't bitter but an honest assessment of the game. I'm sure County will be up there come the end of the season. If we can carry on playing like that then there's every chance that we will be too. In total contrast to last season the trips to The Valley this term look like being thoroughly more enjoyable affairs. The calm, passing game even when under pressure is lovely to watch and those opening minutes last night were the best I've seen from a Charlton team for some time. 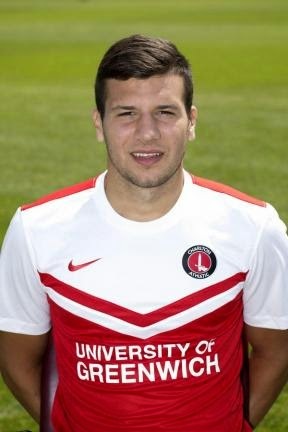 A number of good performances from Charlton players and special mention should go to young Joe. A calm, competent and assured display that belied his tender years. He is a real prospect. We now face three away games in a week before the international break. Frustratingly we've no home game until Saturday 13th September and that seems an age away ! Strange that we got our first goal after our fantastic start had petered out and Derby were in the clear ascendancy, and that the same applied to our second goal, the penalty. But just as against Wigan, we were the stronger team in the second half, I thought, could have scored more, and without young Pope's howler, would obviously have achieved an even more impressive score-line against a good Derby team. I thought Bikey was a little less calm and authoritative than against Wigan. Was he feeling the effects of Saturday's exertions? How he copes carrying all that weight about I really don't know. Anon, agree with your comments. On the way home we were discussing how the scoreline could have been quite emphatic had we taken more of our chances. It wouldn't have been a true reflection of the game of course but was a possibility. If we carry on as we are and Igor starts taking more of his opportunities then it's not hard to envisage us handing out a pasting to someone ( did I really write that ! ). I think Igor is only going to get better! We have a real gem on our hands here. Let's hope he does not get loaned out to the mother ship in January! Anon, agree Igor is a bit special and with the right partner should do very well. Hopefully that partner can be George.